SAN FRANCISCO (CNS) — A homeless San Francisco man was among the thousands of Americans who joined the Catholic Church over the Easter weekend through their participation in the Rite of Christian Initiation of Adults. Michael Riddle, 41, was first attracted to St. Boniface Church because it offered the homeless the chance to sleep in the church’s back pews between 6 a.m. and 3 p.m. In the process, his eyes were opened to the beauty of the Mass and the Catholic Church. “I spent a few months just coming in to the church and resting and then stayed for the Mass,” Riddle said in an interview with Catholic San Francisco, the archdiocesan newspaper, at St. Boniface, where he now attends Mass daily. The Gospel often brought him to tears, he said. But it made him laugh sometimes, too. “It wasn’t that much of a stretch to see my own life in some of the readings,” he said. Things started going badly for Riddle when his family moved from Palm City, Fla., to San Francisco, where he said some combination of “culture shock” and escalating mental illness — he has been diagnosed with bipolar disease — manifested in truancy problems in school, an increasing sense of isolation and the start of a drug habit. He dropped out of both high school and a local trade school and discovered the professional roller speedskating circuit in Golden Gate Park. “I did well in the skating scene,” he said. He toured the country and was a national competitor in the sport. “For a while, the city was my playground,” he said. That playground turned dangerous with a drug habit that started first with crack and then escalated to speed, heroin and, finally, prescription drugs. Riddle said his drug problem coincided with the progression of his mental illness, which by then was marked by unpredictable waves of darkness lasting six months or longer. “The drugs actually caused the same symptoms as manic depression but I felt at the time that at least with drugs, those symptoms were in my control,” he said. After what Riddle calls a “deep, dark decade” between ages 25-35, he weaned himself off his drug habit and changed his eating habits as well as his friends. He began doing what he describes as “more virtuous things,” like exercising and spending time in nature. Unemployed since 2012, he lost the walk-up that he said cost him 90 percent of what he earned at a lighting retailer in Oakland. That’s when he started going to St. Boniface and got caught up in Mass. He entered the RCIA after he approached a nun after Mass to help answer a question he had about a reading in the missal. When she learned that he was not Catholic and had been receiving the Eucharist, she corrected him and referred him to the RCIA, a process of conversion and study in the Catholic faith. “I didn’t know what was involved or what a sacrament was,” he said. Riddle’s story may be unique, but it’s one of thousands recounted this Easter as new Catholics joined the church. Many were catechumens, or people not yet baptized, who received the sacraments of initiation — baptism, confirmation and first Communion. Others were candidates, who were already baptized Christians but entered full communion with the church by receiving the Eucharist for the first time. Not every archdiocese or diocese had precise numbers of those entering the church in the parishes in its jurisdiction, but those archdioceses reporting numbers to U.S. Conference of Catholic Bishops included: Galveston-Houston, 2,300; Atlanta, 1,913; Los Angeles, 1,666; New York, 1,350; Washington, 1,306 (the largest number in its history); New York with 1,350; Detroit, 1,180; Newark, N.J., 1,075; Seattle, 1,045; Chicago; 950; Cincinnati, 946; Oklahoma City, 768; Baltimore, 700; Philadelphia, 695; Boston, 650; Milwaukee, 642; Mobile, Ala., 482; and Omaha, Neb., 480. Dioceses reporting their catechumen and candidate numbers included Raleigh, N.C., 1,200; Austin, Texas, 790; Columbus, Ohio, 570; Lansing, Mich., 646; St. Augustine, Fla., 592; Grand Rapids, Mich., 506; Lafayette, Ind., 383; and Metuchen, N.J., 270. In Metuchen, an online video of the “Ave Maria” moved Jian Wang, a civil engineering student at Rutgers University, to become Catholic. A native of China, his mother left the family when he was 2 years old, and while he was in college, he lost his father. A simple Google search got him in touch with the university’s Catholic Center where his journey to become Catholic began. In the Archdiocese of Detroit, David Cupp, who said he had not “practiced much of anything for years,” came to the Catholic Church after the unexpected death of his wife of 40 years, who was a devoted Catholic. He joined the church as a way to honor his late wife. “What keeps you sane is that you have to believe that there is a true God,” Cupp said. The numbers may be on the short side. 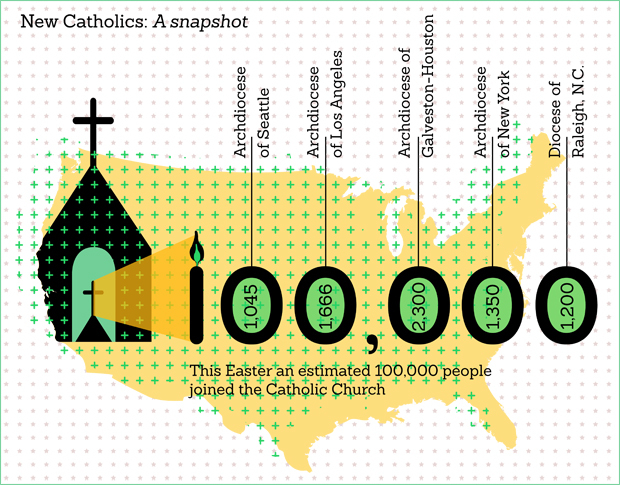 The Center for Applied Research in the Apostolate, housed at Georgetown University in Washington, estimated that more than 100,000 adults would be joining the church over Easter. In an April 11 posting by CARA’s Mark M. Gray on its research blog, Nineteen Sixty-four, he cited marriage to a Catholic and “liking the faith” as the two prime reasons adults join the church. A Pew Research Center “Faith in Flux” study indicated that 72 percent of Catholics joining the church in adulthood cited marriage as an important reason for their switch in faith. The figure is not much different from a 1954 estimate of 75 percent joining the church following an interfaith marriage from a Jesuit priest, Father Joseph Fichter. The pendulum, though, does not swing so readily in the other direction. “Only 13 percent of former Catholics cite marriage to someone who is not Catholic as being an important reason for their conversion to another faith or having no religious affiliation,” Gray said. Gray said about 7 percent of adult Catholics joined the faith in adulthood — about 4 million in all. But “about one in 10 adults — 11 percent — we have surveyed in-pew at Masses nationally identify themselves as Catholic converts,” he added. “They are among the most active Catholics in the church,” Gray said. Their rate of being “somewhat” or “very” involved in their parish beyond Mass attendance, and going to confession at least once a year, is more than double that of all other Catholics, according to CARA research. Catholics who joined the faith in adulthood also regularly read religious or spiritual publications and books, agree “somewhat’ or “strongly” that they are a “practicing Catholic,” and agree that their faith is either “the most important” or “among the most important” things in their daily life at a significantly greater rate than all other Catholics. They also attend Mass at least once a month, register with a parish, regularly contribute to parish offertory collections, and agree “somewhat” or “strongly” that they are proud to be Catholic at much higher levels than all other Catholics. Gray is a staff writer for Catholic San Francisco, the archdiocesan newspaper. PREVIOUS: Teresian Carmelites in India dispatch first group of sisters to U.S.